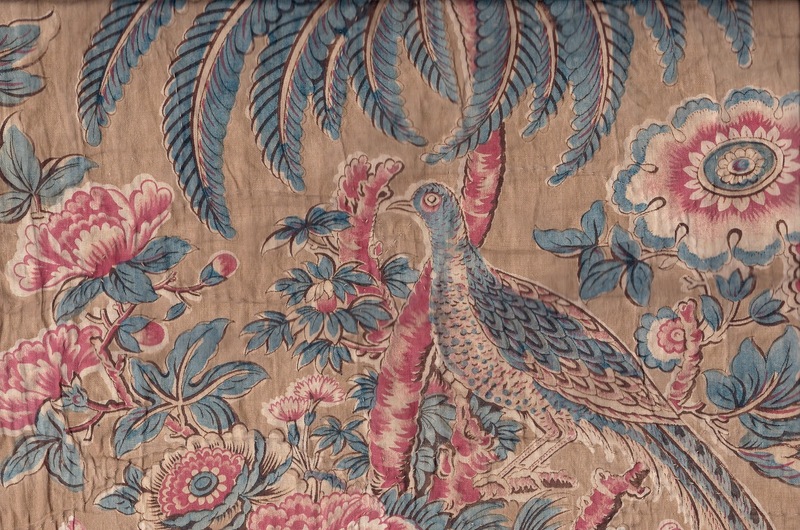 Furnishing chintz c. 1815--partridge and palm tree motifs. This fabric was block printed with pencil blue overdye of the yellow for the foliage. Originally this overdying probably produced some shade of green. The background is the popular tan blotch or tea ground. Think tea served with milk! Of the 9 vintage fabric sample books, one is Turn of the 20th Century 'Day Book'. Examples of each day's mill production are pasted in the book with a style # and date written in pencil on the top of the page. Alas, there is no indicator of the mill's name or location. Here is style #2149 from August 29,1899! There are 2 different prints in 4 color ways. In the past when I have lectured about late 19th century cotton textiles and mention the Economic Panic of 1893, I often would receive blank looks from the audience. No longer! Now everyone can relate to an economic downturn. The 1893 version was caused by a railroad overbuilding collapse coupled with shaky railroad financing which led to bank failures. This sounds so very familiar. The effects on the textile industry in America were swift. Many mills went out of business; others lowered their costs by using less expensive greige goods, cheaper versions of synthetic dyes (many of which proved fugitive) and a pared down design staff. Cotton prints for clothing were often simple designs in two colors. The color palette shifted to cool blues, burgundy or claret and off white shirtings. 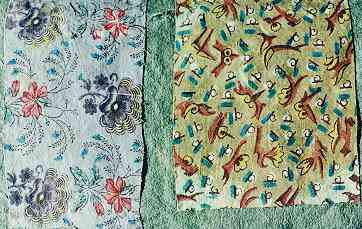 We see these fabrics in many 1895-1925 quilts. 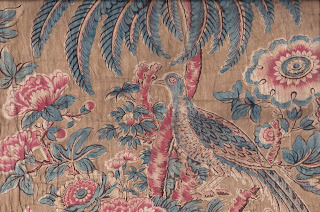 I am now seeing reproductions of some of the high end fabrics that were available in the early 20th century. The designs are sophisticated and the colors include oyster, shell pink, silver, taupe, brown, champagne and tobacco. 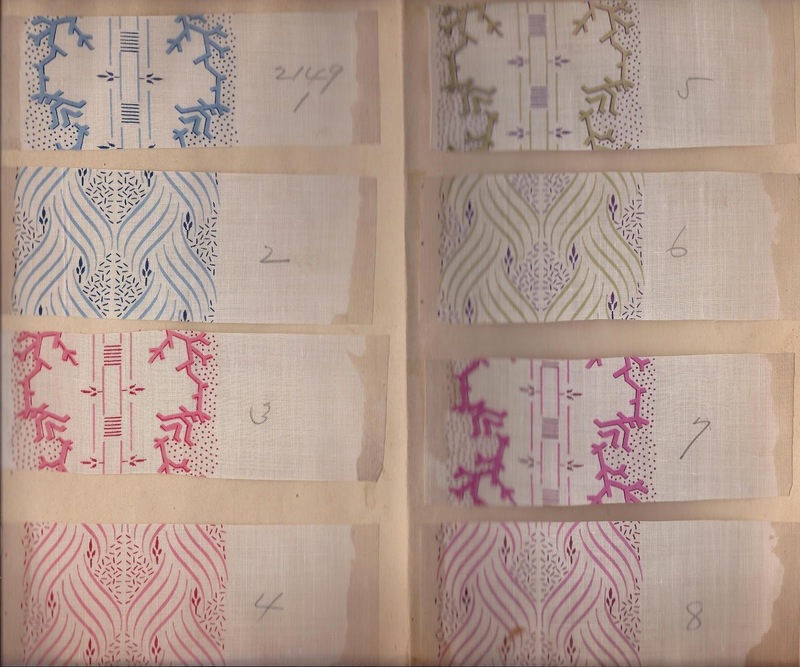 Archival mounting of fabric samples in the c. 1830 Dargate book has helped to preserve the colors of the original printing. The paper used for the pages of the book is rag paper. Paper made from tree bark mixed with fibers of hemp and flax was invented by the Chinese 2,000 years ago. This technology slowly made it way to Europe where rag paper was often made from discarded cotton and linen rags. This paper along with a glue made from either horse hooves or fish bones has been good for the stored fabric samples. White rag paper was the highly desirable, poorer grades were often coffee colored or a light grey. In 1844, a Canadian, Charles Fernerty and a German, F. G. Keller both invented the machinery and the process of making paper from wood pulp. This was followed in 1860 by the invention of wood grinding machines. The manufacturing of cheap paper allowed for an explosion in newsprint. 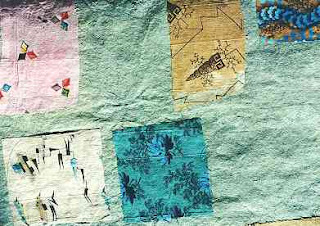 However, pulp paper is very acidic and not a good environment for storing textiles. 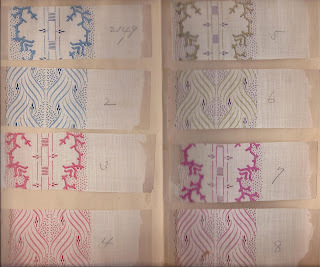 Most of my 19th century sample books are pre 1860s. Last Tuesday Ron and I celebrated the 4 year anniversary of his pancreatic cancer diagonsis. He is alive and healthy today! 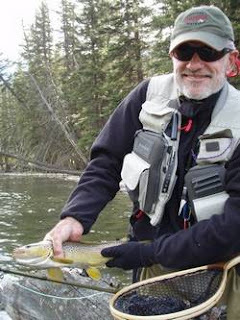 ps so is the fish, a 'catch and release' guy.